Jack and I spent the yesterday evening ringing the bell for the Salvation Army outside Walmart. It wasn’t planned. The opportunity just came up when a friend who was coordinating a day had a slot open up. But it was one of the most rewarding things I’ve done this holiday season. Maybe all year. He was absolutely right. It was such a small gesture, but even the little things we do make a difference. It was $2 to them, but it will mean homeless people will have hot meals and warm places to sleep and families who wouldn’t have been able to afford it will have a Christmas. It got me to thinking too. Imagine what a difference we could make if we all set out each morning and thought to ourselves, “What can I do today to make a difference?” Even little things like smiling at one another when we pass or holding the door can make the world a much more pleasant place. In fact, I’d like to challenge us all this holiday season to do just that. 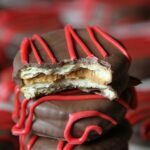 These Chocolate Covered Cookie Butter Cookies are one of my new favorite holiday treats. 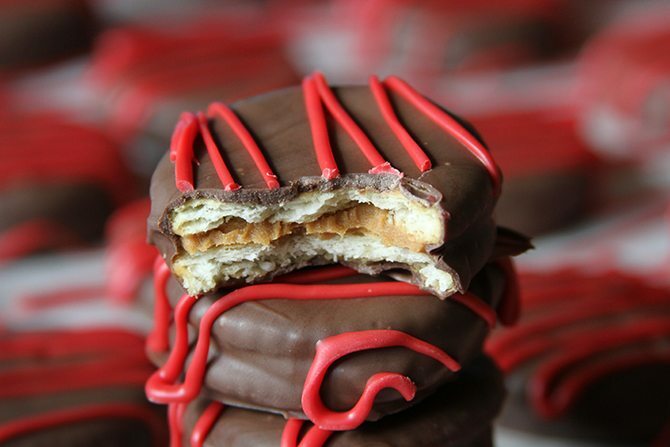 We’ve been making them for years filled with peanut butter, but adding the cookie butter gives them a delicious twist. 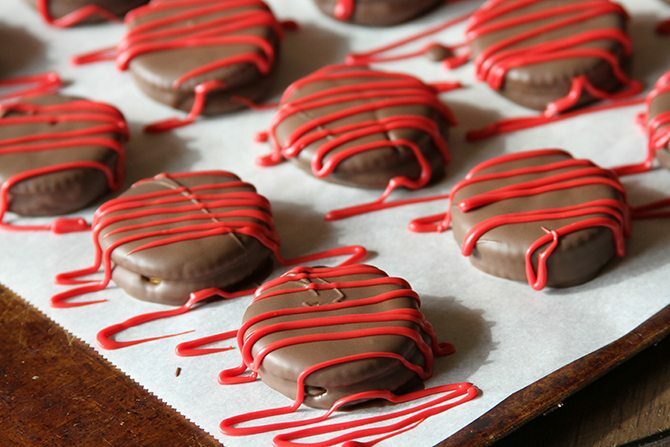 They’re a super easy cookie to add to your holiday treat making. I just know y’all will love them! Spoon about 1 teaspoon of the cookie butter between two crackers and twist them slightly together to evenly distribute the cookie butter. Repeat until all of the crackers have been used. Melt the almond bark according to the package directions. Dip the cookies into the bark, coating all sides. Remove with a large fork and tap on the edge of the bowl to remove the excess chocolate. Place on a sheet of wax paper and allow them to cool completely. I drizzled a little red colored almond bark over them for decoration, but you could also use sprinkles or sugar. You could even used some crushed Biscoff cookies! It’s amazing! It has a texture like peanut butter, but a very different flavor. You’ve got to try it! Oh Stacey – what a sweet post! I cried to think of you taking your son with you to ring the bell. That’s SO awesome! Thanks for sharing those sweet interactions with others as well. I never thought to put cookie butter between these crackers. 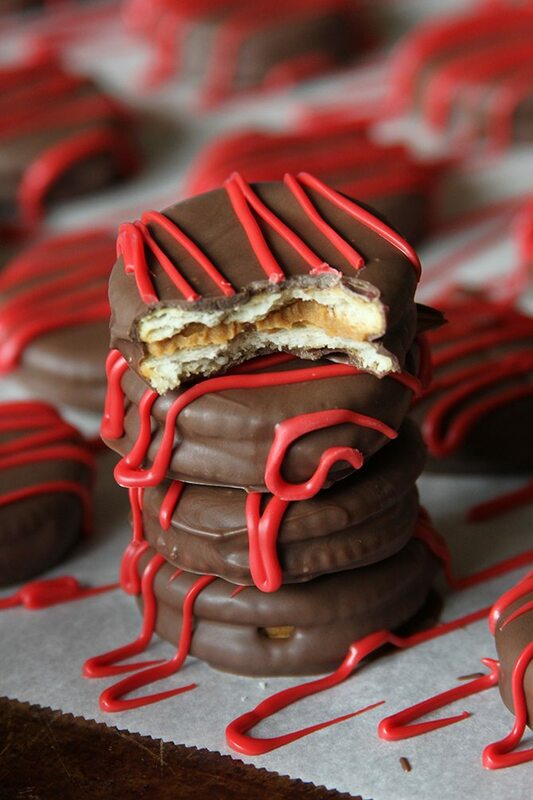 If I had some on hand, I’d run to the kitchen now and make them. WOW! Terrific idea. Love your red drizzle over them too. Thanks for all you share…for all you are. A very merry CHRISTmas to you and yours! Thanks so much, Marsha! It was a great experience for us both! Merry Christmas!! Yum! 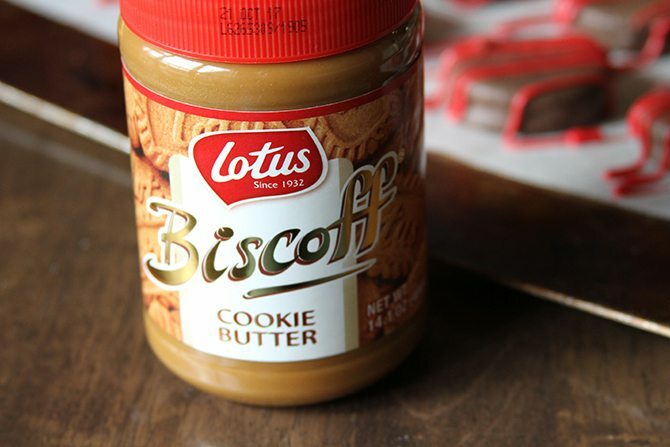 You had me at cookie butter! where do you get cookie butter? I can find it in most grocery stores and even Walmart. It’s usually by the peanut butter.